Easily perform audits, checks and inspections! Questionnaires and checklists are invaluable during audits, tracers, safety rounds, evaluations and other measurements or inspections. It is becoming increasingly important for organisations to determine whether their systems actually comply with quality and safety standards, guidelines, policies and/or goals. A clear planning and smart audit software are very important in this process. Using visual representations and useful questionnaires, the Audit & Inspect module supports all the different steps: from planning and implementation to reporting and actions. This also helps you to focus on a specific standard (such as the ISO quality standards), period or department. In this way, you support compliance management and you can guarantee compliance with legislation and regulations. Equipment has to be one hundred percent reliable. Any deviations due to late, poorly performed or – even worse – a lack of quality control can have major consequences. Some items need to be checked on a monthly basis, others on a weekly or even daily basis. How can you safeguard this process and ensure that the correct manuals, (malfunction) notifications and other relevant data are available anytime and anywhere? The Audit & Inspect module can offer you this overview. You will always have access to clear dashboards that combine data generated from questionnaires and checklists. In addition, the Audit & Inspect module provides a structured overview of which audits and checks have been performed, the objectives and the applied standards and frameworks. For example, after completing an ri&e checklist, it is easy to add and delegate improvement measures. A clear planning helps you to manage deadlines and ensures that you can see the status of your audit or inspection anytime and anywhere. Are you curious about what our audit software can offer your organisation? Request a free online demo and ask our professionals any questions that you might have without having to commit. Want to get started immediately? With over 20 years of experience in various industries, we can offer you several best practices. Use this knowledge to accelerate your implementation project. You can start working in a smarter and more efficient manner today. Perform systematic and disciplined research to safeguard good and reliable performance. 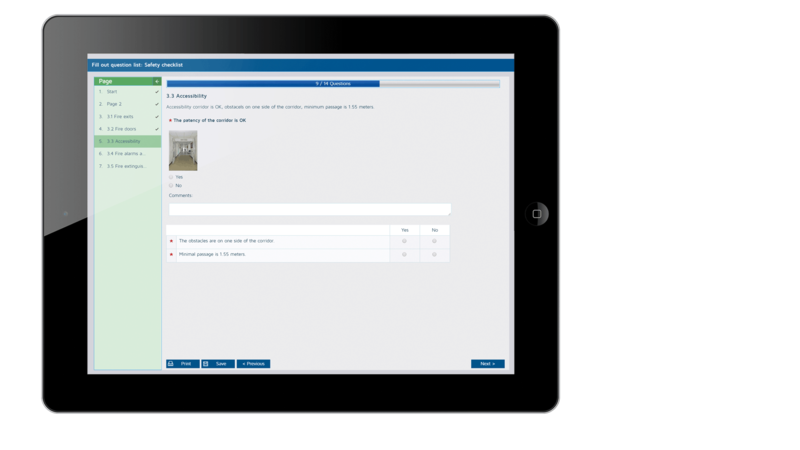 Create questionnaires for periodic testing of quality standards and safety requirements. Increase awareness of risks through active inspections and prevent damage. Identify opportunities for improvement by actively studying customer and employee satisfaction surveys. Would you like to know more about Audit & Inspect? Are you curious about how you can simply perform audits, checks and inspections? Simply download our Audit & Inspect brochure.